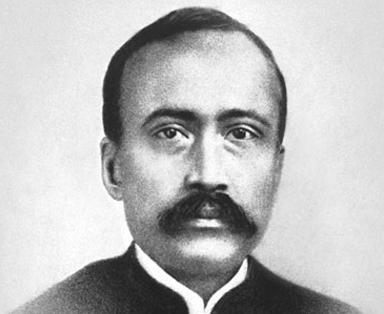 Bhagabati Charan Ghosh, Paramhansa Yogananda’s father. Years ago, before you were born, I asked my superior officer—your father—to give me a week’s leave from my Gorakhpur duties in order to visit my guru in Benares. Your father ridiculed my plan. “Our path took us to the edge of a tranquil field, where the rays of the late afternoon sun were still crowning the tall ripple of the wild grass. We paused in admiration. There in the field, only a few yards from us, the form of my great guru suddenly appeared! “Bhagabati, you are too hard on your employee!” His voice was resonant in our astounded ears. He vanished as mysteriously as he had come. On my knees I was exclaiming, “Lahiri Mahasaya! Lahiri Mahasaya!” Your father was motionless with stupefaction for a few moments. “Of course.” Joy filled me at the miraculous answer to my prayer, and the quick, favorable turn of events. The next evening your parents and I entrained for Benares. We took a horse cart the following day, and then had to walk through narrow lanes to my guru’s secluded home. Entering his little parlor, we bowed before the master, enlocked in his habitual lotus posture. He blinked his piercing eyes and leveled them on your father. To their joy, he initiated your parents in the spiritual practice of Kriya Yoga. Your father and I, as brother disciples, have been close friends since the memorable day of the vision. Lahiri Mahasaya took a definite interest in your own birth. Your life shall surely be linked with his own: the master’s blessing never fails.